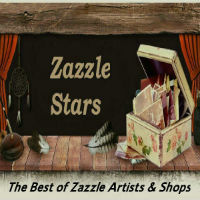 Here you will find a wide variety of eclectic, artistic, and unusual customizable gifts. The name and image of Clown Fish Cafe are meant to convey a sense of humor; a fun, colorful style; and a place to kick back and relax while perusing a menu of varied items that appeal to different tastes and interests. The most popular items are the monograms which come in various color combinations. Also found here is some of my digital art and a little photography. My Portraits Naturally store celebrates wildlife in all of their colors, forms, and capriciousness. It features my fine nature photography of plants and animals, most done in portrait style. My Redbubble store contains various images from both Clown Fish Cafe and Portraits Naturally placed on products that may be different than what Zazzle has to offer. My Society6 store contains various images from both Clown Fish Cafe and Portraits Naturally placed on products that may be different than what Zazzle has to offer. My Crated store features my fine animal and plant photography on prints and wrapped canvas. My store on The Kase features a selection of images from both my Clown Fish Cafe and Portraits Naturally stores, making them available on various smartphone and tablet cases. Please stop by for a visit anywhere, any time!